As teenagers, the army surplus was our go-to store for everything cool: combat boots, wool socks, khaki jackets, aviator hats. Much to our mothers’ chagrin, the military look had made its way into the style guides… and into our closets. So how did that military influence conquer the world of fashion? Chelsea Arts Club, London, 1919. Party night. The “Great Dazzle Ball” is in full swing. Guests are dressed to the nines in outfits inspired by the ships that have been colourfully painted to trick the enemy. Military camouflage, even in its early days, made a splash on the fashion scene. Camouflage techniques quickly evolved from those simple hand-painted designs. By the Vietnam War, they were adopted by all troops. Steeped in controversy, that war inspired numerous protests led by, among others, veterans who took their political dissent to the streets in full uniform. Before long, young protesters had discovered the riches of army surplus, camouflage design was a symbol of rebellion, and artists were eagerly appropriating it. From punk-rock band The Clash to the works of Andy Warhol, military camouflage can be found in all areas in all forms. Even the stars of fashion design have been inspired by camouflage – just check out the dresses of Jean-Charles de Castelbajac and Yohji Yamamoto now on display … at the Canadian War Museum. Fashion and camouflage are united in the exhibition gallery and beyond. On the 4th of June, 26 young people showcased the results of a collaborative project between the Museum and three regional institutions. 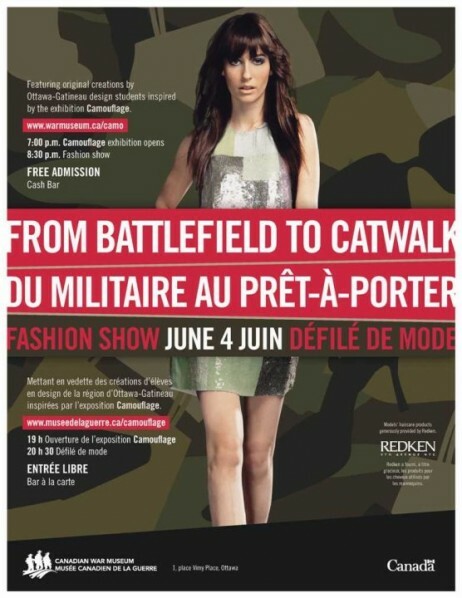 Students of the Richard Robinson Academy of Fashion Design and De La Salle and Canterbury high schools were handed the challenge of creating clothing inspired by camouflage. Their creations were featured in a colourful fashion show in the LeBreton Gallery of the Canadian War Museum. For an evening, the Museum rocked to the rhythm of fashion. A meeting room was transformed into a hair and makeup studio while the heavy artillery and military vehicle gallery featured an impressive catwalk. Dresses and costumes blended into nature of all kinds; insects and snowflakes, dark nights and desert sands. Innovation knew no limits for these unique creations. Artists of the early 20th century were once moved to create it – now, camouflage itself inspires a new era of creative design.